One hour of Blessed Sacrament Adoration was held at Itami Parish Chapel. We were seven Oblates present for the adoration from 11 am to 12 pm. Fr. Wency exposed the Blessed Sacrament and gave the final Blessing. Fr. Hiran read the Scripture reading taken from St.Paul’s letter to the Romans. The Scripture text (Rom. 15:1-3) helped us pray and reflect on the burning zeal of our Founder in taking care of the weak in our mission. We also read the Oblate Rule 8a, which reminded us that our lives as Oblates have to be “enriched by the poor and the marginalized” so that we can “hear in new ways the Gospel we proclaim”. Fr. Stephen led the intercessory prayers that were meaningfully prepared to recall the life events of our Founder St. Eugene. 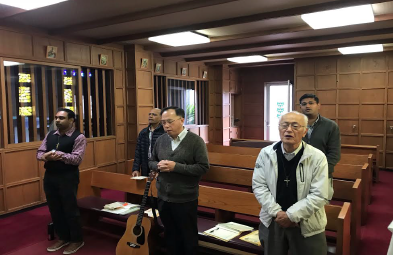 Bro.Yagi helped us to glorify the Lord with beautiful hｙｍｎｓ. In front of the Blessed Sacrament we renewed our Vows and concluded the adoration with Salve Regina. 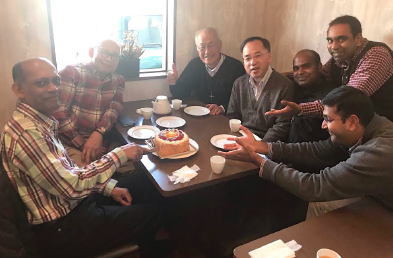 Soon after the prayer service, we went out for lunch at a nearby restaurant. Fr. 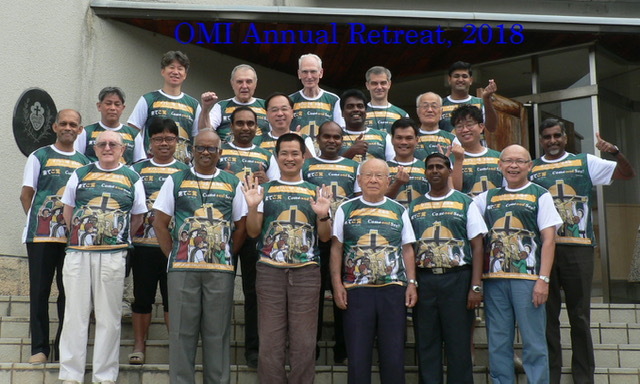 Inui blessed the food asking the almighty to provide necessary strength to all the Oblates to remember always the spirit of our Founder, to preach the Gospel. During lunch we also celebrated the 54th Birthday of our Delegation Superior Fr.Bradly. Hiran surprised Bradly with a birthday cake. Some delicious food was served, and everyone appreciated and enjoyed the meals. After lunch we gathered at the Oblate rectory for a short discussion on how to lead and witness in future as a district. 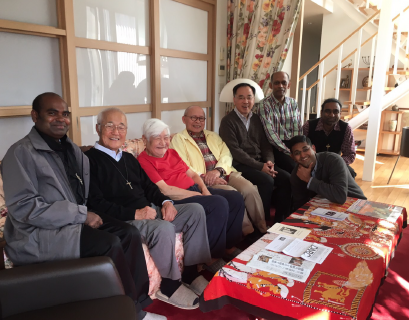 During the discussion it was mentioned that many in Toyohashi parish are interested in the Oblates and their missionary activities. It was suggested that in our Oblate parishes, for people to know us better, we take one Sunday, and call it an ‘Oblate Day’. 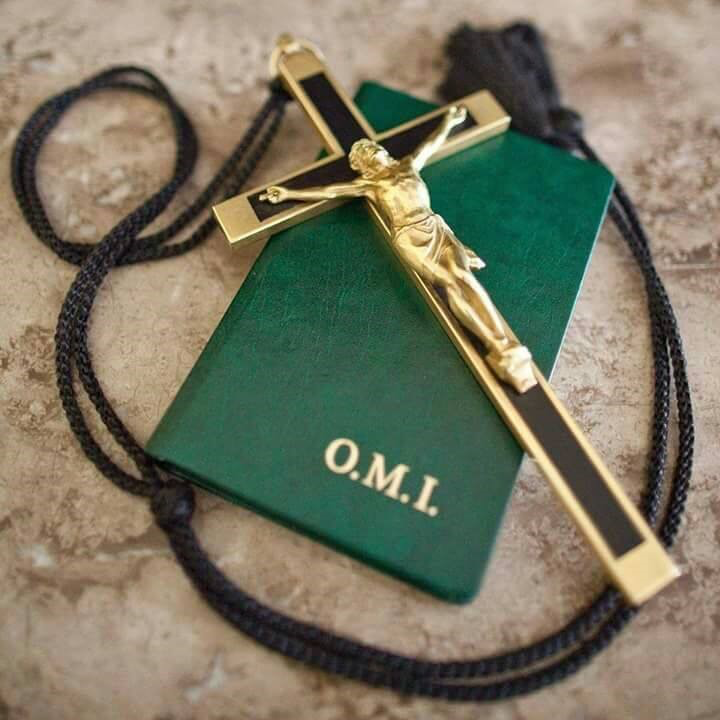 One mentioned that since the Year of Oblate Vocations comes to an end on January, 25, 2019, it might be good to choose the last Sunday of that month. Word was mentioned about the lay participation in our mission. Fr. Yamaｓaki filled with joy joined us for a short chat. We made use of that opportunity to take a few pictures with him. The discussion came to an end around 2.30 pm with a Hail Mary, asking the Blessed Mother to give us the grace to continue our mission. This entry was posted in Delegation Articles. Bookmark the permalink.